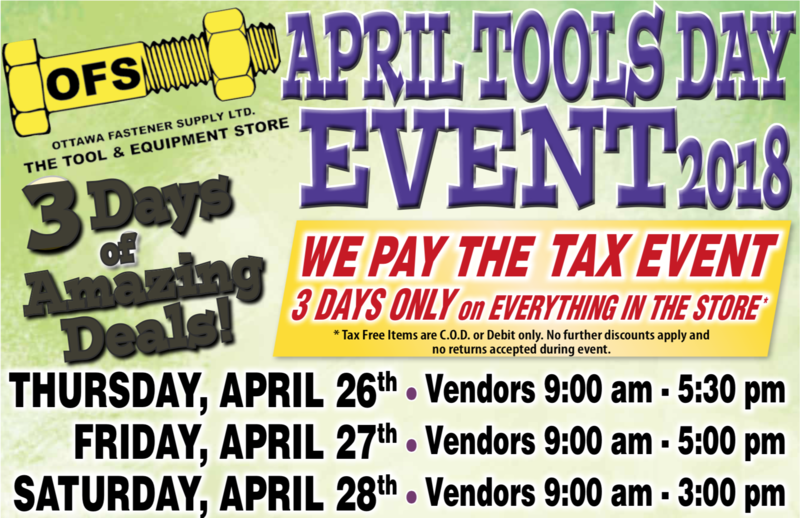 Ottawa, Ontario: The Tool and Equipment Store in Nepean is presenting its 13th annual April Tools Day Event from April 26 to 28 with promotions and activities for both contractors and do-it-yourselves. Tool and equipment vendors will be on-site, prizes are to be won, The Tool and Equipment Store will pay the tax and CHEZ 106 will be on-site as part of its TOYS19 promotion. “This event is a once-a-year added-value and pricing special,” said The Tool and Equipment Store general manager Peter Perreault. The April Tools Day Event will be giving away free tools and batteries with select purchases. Company representatives from major tool and equipment manufacturers, including DeWALT, Makita, Milwaukee, Husqvarna, and BOSCH, will be on-site to answer questions. Special pricing will be featured. The Tool and Equipment Store is a CHEZ 106 TOYS19 sponsor. April Tools Day Event attendees on Saturday April 28 from 10 a.m. to 1:45 p.m. will receive ballots from CHEZ 106 from which two keys will be drawn. One key holder will be selected later by CHEZ 106, from all keys drawn in the promotion to date, to win the entire TOYS19 prize package. That prize package includes a Milwaukee power tool pack from The Tool and Equipment Store. “Nobody else has the promotions that the April Tools Day Event features,” said The Tool and Equipment Store business development manager Bart Danis. “We have been doing this since 2006 and it gets bigger every year,” he added. Vendors will be on-site Thursday April 26 from 9 a.m. to 5:30 p.m., on Friday April 27 from 9 a.m. to 5 p.m. and on Saturday April 28 from 9 a.m. to 3 p.m.
A-Channel and CTV’s Sarah Freemark will both be on-site on the morning of April 26. The Tool and Equipment Store is distinguished in the greater Ottawa area for offering an in-house tool repair service. Both contractors and do-it-yourselfers will not want to miss this event. “The added-value deals, the on-site vendors and the free tools and batteries make the April Tools Day Event a special one,” continued Danis. “Nobody else has these promotions – they are exclusive to us,” he concluded. About The Tool and Equipment Store: The Tool and Equipment Store features over 10,000 square feet of equipment, fasteners, outdoor power equipment, tools and accessories for both contractors and do-it-yourselfers in the greater Ottawa area. It is unique in that it services everything it sells and this includes in-house tool repair. It has been in business for 30-years and continues to grow.